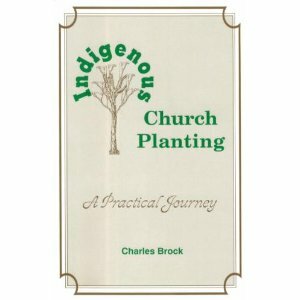 On my Book Review page near the bottom I have a summary of “Indigenous Church Planting”, by Charles Brock, published by Church Growth International, Neosho, MO. 1994. 272 pages. ISBN 1-885504-27-6. If you have any interest in church planting you should add this book to your library, read it and learn from it. If you go to the Book Review page the review is near the bottom and this picture is on the left side at the beginning of the summary. Yesterday I had the opportunity to go to a church planter’s seminar/lunch. It was only two hours long and I wasn’t sure that I really wanted to go. Some of my reasoning was that I don’t really agree with the theology and philosophy of the organization and its founder. I have never met the man, nor do I believe everything that is written about him. Plus I figured I would be the oldest man there and I wasn’t sure of the attitude in which I would be received. So two days before the event I went online to register, kind of hoping registration would be closed. It wasn’t, so I registered and attended. Now I was the oldest man there. And I might add I was the best dressed too. Even though I was business casual. It wasn’t as crowded as I thought it would be. I found a table near the back and asked the young guys sitting there if the seat was taken. They welcomed me to their group and we began to talk. One of the guys attended a church while he was in college in a different state and I actually know the pastor. It really is a small world. Our God orders the steps of a righteous man, doesn’t He? The meeting was started with prayer and lunch, and then the panel took the stage and began to talk and field questions. I kept quiet the whole time. Really. There were times I wanted to speak or comment or ask a question, but I didn’t. I went there as a learner. I wanted to learn about leaders in their network, about their ideas of church planting and about their ideas of pastoring. And learn I did. I still don’t totally agree with the organization theologically or philosophically. I have some minor concerns about some of the things that were said. I think in twenty years the four younger men who were speaking to the even younger men will have both a different perspective and words to offer. We can all change over time. I really do wish there were some older men there with me. Some older men missed out on something pretty good. These younger men missed out on some input from Christian leaders in a different stage of life. But I am truly glad I went and learned with my younger brothers. I enjoyed myself greatly. If I can try to be humorous: there was so much testosterone in that room! There were so many hopes and dreams of serving the MOST HIGH GOD! It was both a pleasure and privilege to be in their company. I was with a band of brothers who want to serve their Lord and Savior Jesus Christ. They are willing to risk it all; they are willing to go where HE sends them. Yes, they have a lot to learn. But I for one am willing to help the younger men who are called by our God. I am willing to teach them. I am willing to learn with them. I am willing to learn from them. Are you? And, I still have a lot to learn and I want to keep learning. Do you? Those young men (and the two young ladies) represent the future of the Church. God owns the Church. No man or woman here has any stock or part ownership of the Church. So will you join me in praying for some young men who are and will be leaders in the body of Christ? You may even know some personally. They will always be completely surrendered to God (Rom. 12:1-2). They will be in His Word to study and live it (2 Tim. 2:15). They will learn to balance their private life and public life. They will understand that God cares about character more than giftedness. They will learn about diligence and self-discipline. They will stay faithful to God no matter what. They will confidently know what God has “called” them to. They will have older godly men to mentor them and younger godly men to mentor. Their families (if they have them) will be protected from the evil one. Thank you for looking around, seeing some young men with potential and for praying (interceding) for them. They may never know it, but God will and your prayers will make a difference. I am excited about the future of the Church! He with the King of glory Shall reign eternally. Amen.